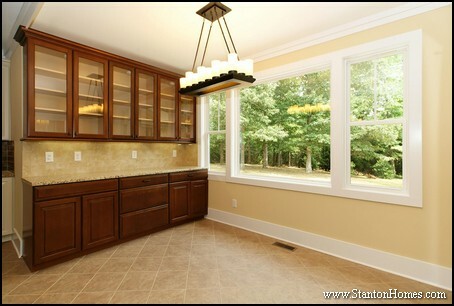 7 of 14 or 50% of homes in Apex included a walk in pantry in their floor plan layout. No Apex homes available for viewing in the Triangle Parade had a separate Wet Bar in Game Room or other area included on their floor plans. What does this mean for homebuyers in Apex NC? Parade of Homes entries generally represent what trends builders believe homebuyers are looking for today. This is representative only of the homes featured in the Parade of Homes, and not intended to be a general indicator of the Wake County new home market, though Parade of Homes can be representative of overall trends. These statistics were derived by Penny Hull from public information about Parade of Homes entries, and are copyright Stanton Homes. The statistics calculated above represent Parade of Homes entries in Wake County in Arcadia West, Colvin Park, Enclave at White Oak Creek, Hempstead at Beaver Creek, Madison at Evans Creek, Regency at White Oak Creek, Riley's Pond, Siena at Bella Casa, Stillwater, The Pines at Wake Crossing, The Townes at Bella Casa, Verona at Bella Casa new home communities. Guest bedroom homes are a great solution for short-term guest stays and long-term multi gen living plans. 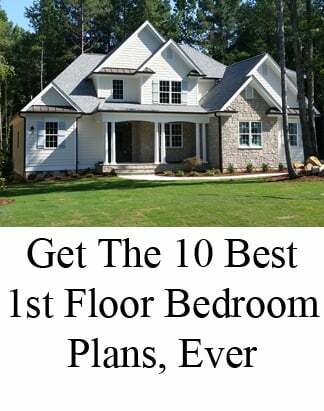 Where can I find homes with a guest bedroom downstairs? 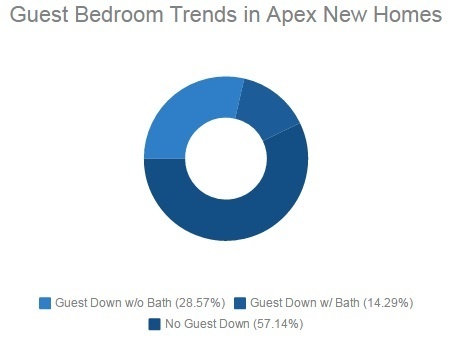 Guest Suite Trends in Apex Custom Homes: how common are guest bedrooms on the first floor? Fewer than half the entries available for viewing during the Triangle Parade of Homes in Apex included a guest bedroom on the first floor. Fourteen new homes in Apex were featured in the Parade of Homes. 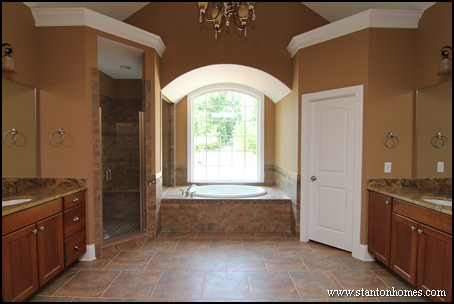 4 of 14 or 29% of homes in Apex have a guest room downstairs without a private bath. 2 of 14 or 14% of homes in Apex have a guest suite downstairs with a private bath. 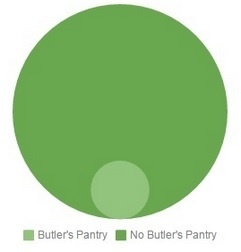 8 of 14 or 57% of homes in Apex do not have a guest suite on the first floor. 0 homes have a multi gen or mother in law suite, despite rising trends of multigenerational living new homes. Parade of Homes entries generally represent what trends new home builders believe homebuyers are looking for today. 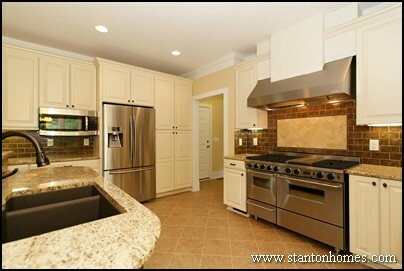 Learn more about building a new home with Stanton Homes! Special Meet the Builder Event Nov. 12th - Click here for address and more details. 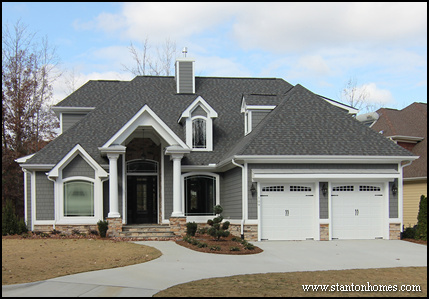 This is representative only of the homes featured in the Parade of Homes, and not intended to be a general indicator of the Wake County new home market, though Parade of Homes can be representative of overall trends. These statistics were derived by Penny Hull from public information about Parade of Homes entries, and are copyright Stanton Homes. The statistics calculated above represent Parade of Homes entries in Wake County in Arcadia West, Colvin Park,Enclave at White Oak Creek, Hempstead at Beaver Creek, Madison at Evans Creek, Regency at White Oak Creek, Riley's Pond, Siena at Bella Casa, Stillwater, The Pines at Wake Crossing, The Townes at Bella Casa, Verona at Bella Casa new home communities. 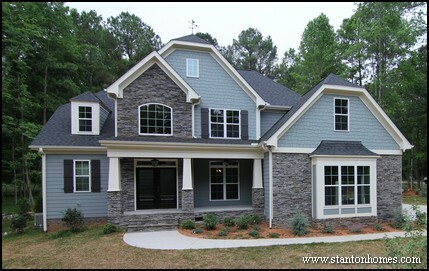 1 of 14 or 7% of homes in Apex have a one story floor plan. 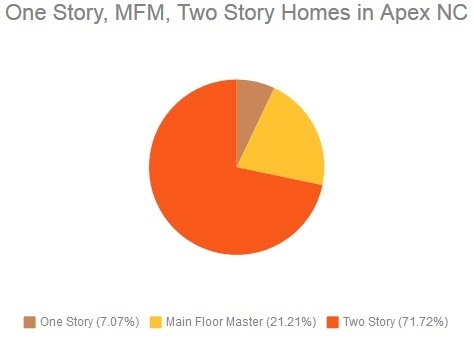 3 of 14 or 21% of homes in Apex have a main floor master (or downstairs master bedroom) floor plan. 10 of 14 or 71% of homes in Apex have a two story floor plan. 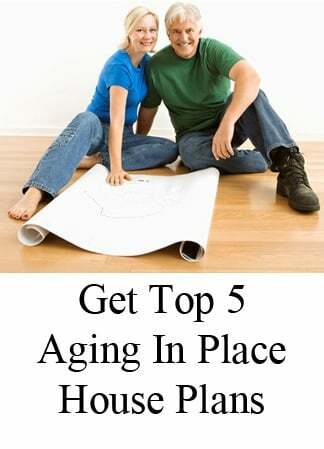 0 homes have a dual master floor plan, despite rising trends of multigenerational living new homes. 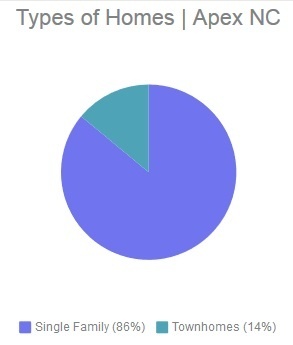 12 of 14 or 86% of homes in Apex have a single family floor plan. 2 of 14 or 14% of homes in Apex have a townhome floor plan. Do New Homes Cost More in Wake County? The cost of new homes is based on a wide range of factors, from the cost of the land the home is built on to the size of the home and the finishes and features. Generally speaking, Wake County homes can cost a bit more, depending on where in the county you want to live, as land and building costs in Raleigh and Apex tend to be a little higher than in neighboring areas of Fuquay Varina, Garner, and Wake Forest. What are the Building Costs for Your Lot in Wake County? 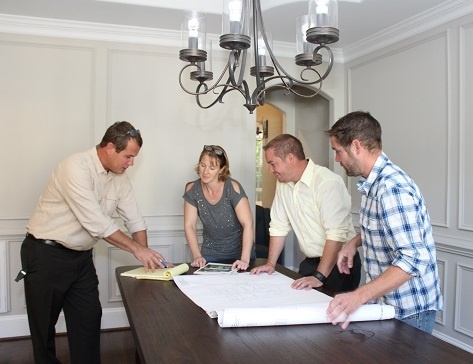 Whether you’ve already purchased a lot you love, want to build on family land, or are considering available lots, Stanton Homes’ custom build process includes an on-site assessment of your floor plan to your homesite, with our builder perspective on what to expect for site work. Learn more about custom home lot assessments, here. Parade of Homes entries generally represent what price points builders believe homebuyers are looking for today. Come on out and see what “custom” means when you collaborate on your new home with a builder renowned for his vision, in our latest Stanton Home; The Bryson. Be sure to peek into the artfully designed Master Closet. 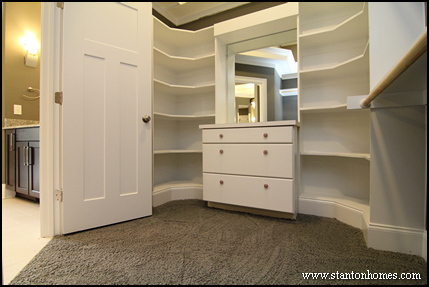 You can’t miss the built-in dresser with mirror and lots of shelving. Look a little harder and you’ll find some "secret storage" areas. 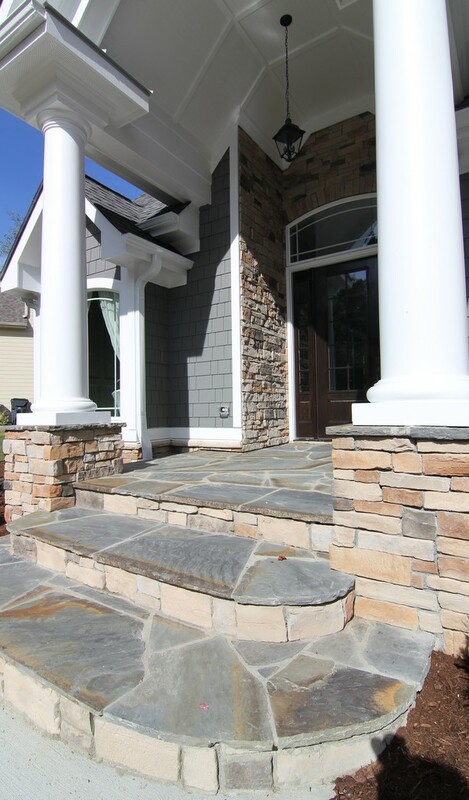 The custom designed flagstone front porch steps and unique vaulted portico set the tone for this warm and welcoming home. 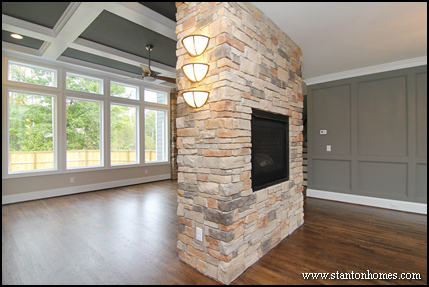 Check out the line of sight throughout the main floor with its bold tradition of stone, see-through fireplace, dramatic windows and natural tone color pallet. As for the cooking show kitchen, formal dining, game room, and all the other specially designed rooms in the Bryson – see them for yourself, this weekend! 4 bedrooms, 3.5 bathrooms, with playful treatments. 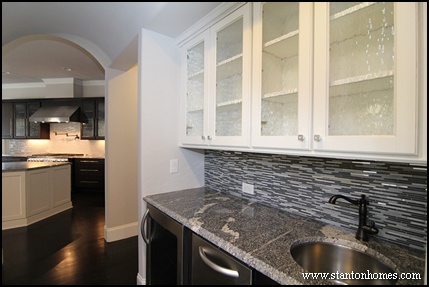 Cooking-show style kitchen with sit-down island, glass tile mosaic, contrasting color pallet and interesting extras. Soaring windows framed in stone columns thoughtfully placed to echo the majestic stone entrance and bring balance to the see-through fireplace. 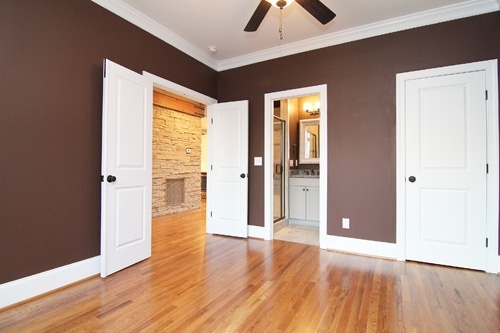 Spacious master suite with striking trey ceiling, private patio entrance, romantic bathroom and amazing walk in closet. Dramatic Grand room with Coffered ceiling and trend-setting dining room where new rustic meets elegance and opposites attract. Welcoming step-up game alcove and bar in the Bonus Room. 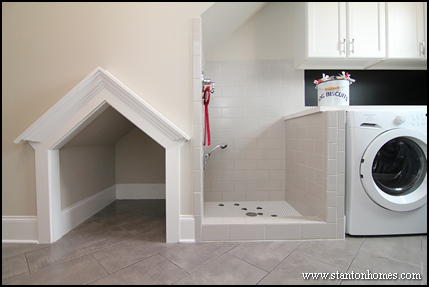 Designer Dog Room complete with hand-crafted doggie shower. Home builders all over the Triangle are putting the final touches on this year's parade entries. 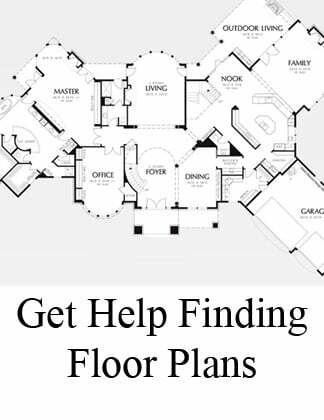 Check out all kinds of floor plans, and get ideas for your next new custom home. Be sure to visit "The Bryson", a custom-designed first floor master with all kinds of unique details, including a "doggie" shower and built-in dog house under the staircase! Luxury homes over a million dollars tend to have some very creative and unique features. It's not everyday that homes like these are available to walk through, but the 2013 Wake County Parade of Homes gives a special opportunity every year to see homes that most of us can only dream about. The Wake County Parade of Homes is a time-honored tradition in the Raleigh area, and custom homes such as these luxury homes are quite the attraction! At these high-dollar homes, be prepared to stand in line waiting to tour during the busier periods of the Parade. And keep in mind, there are a total of 190 homes to tour during this year's Parade of Homes, in a variety of price points, from $134,900 to $2,290,000! 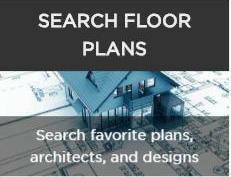 Check out all kinds of floor plans and features, and get ideas for your next new custom home. 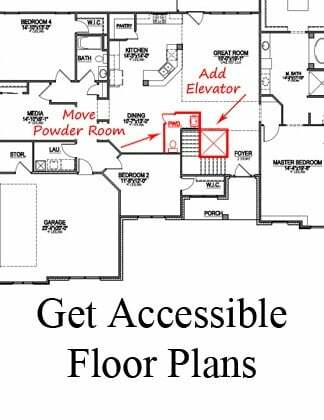 Floor plans, options, features and prices subject to change.